Please, no clothes or furniture at this time. The Dallas Morning News also published a list of ways you can help. 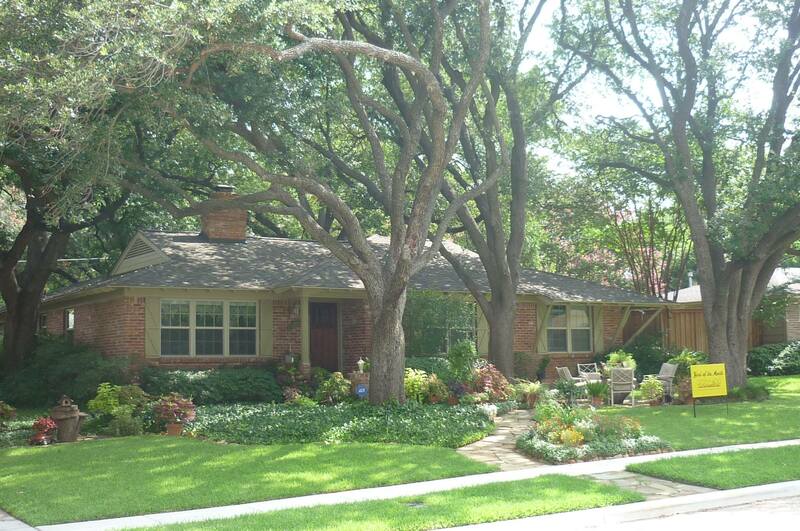 What a blessing and honor it is to be chosen as Yard of the Month by the Heights Neighborhood Association! We’ve lived in our home for 21 years. What a journey of improvements we’ve dreamed and then slowly put into place and are still putting in place! Two years ago we lost one of our large trees between our sidewalk and street. This completely changed the way we design and maintain the bed closest to the street. What was once a shady bed, became a somewhat sunny one. Even though this presented a challenge, it became an opportunity to try out new plants. It’s now a work in progress as we discover what works best. We are trying sunny perennial plants – phlox, echinacea, daylily, indian blanket and purple button, to name a few – in addition to some annuals – zinnia, marigold,and basil. I (Cindy) am an Epiphany Church community organic veggie gardener and have enjoyed bringing home organic knowledge to my yard. One of my favorite organic methods is a solution of seaweed and dish detergent as a great fertilizer and bug preventative. We are thrilled neighbors have enjoyed our yard! It’s fun and humbling to see someone slow their walk to take in God’s blessing of nature’s colors, textures and heights in our little piece of heaven. Thank you again for your generosity in nominating us. We love living in this warm, caring neighborhood, and value your friendship and encouragement. 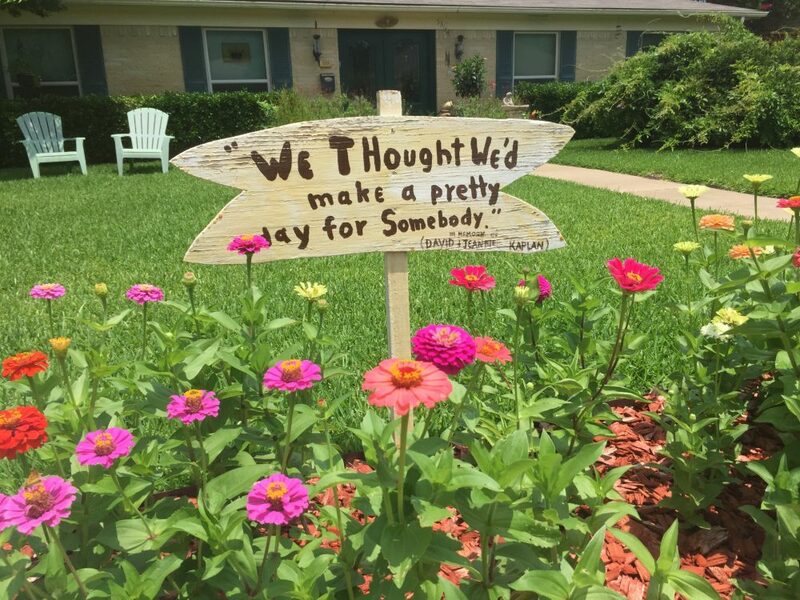 The DuPlants (530 Twilight Trail) encourage neighbors to enjoy their flowers, a lovely tribute to Nanci DuPlant’s father and mother, David and Jeanette Kaplan— who allowed their neighbors to pick their flowers, too. Editor’s note: The following blog post is by Heights Park resident Clara Beaufort. If you are interested in writing for HeightsPark.com, email contact@heightspark.com. We’ve all heard the statistic that roughly 70 percent of the Earth is covered in water. That seems like plenty right? Wrong! Consider these percentages: 96 percent of the total water on Earth is saline, 68 percent is frozen in glaciers and ice caps, 30 percent of freshwater is underground, and one percent of the total water is fit for use. Water is used for millions of purposes including drinking, washing, and watering plants/yards. In addition, it is used to put out fires and has manufacturing applications. In short, water is important, and with the growing population and the fact that freshwater runoff is only expected to increase by 10 percent in the next 30 years, conserving water is vital for the environment and protection of drinking supplies. Now that the facts have opened your eyes, here are a few simple ways you can conserve water in the comfort of your backyard. Wouldn’t it be nice if water grew on trees? While this isn’t the case. We receive free water regularly in the form of rain. 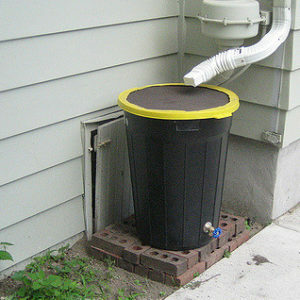 With the right system in place, you can harvest rainwater for watering flowers, gardens and yards. Before you begin, consult the City of Richardson’s ordinance on rainwater harvesting to avoid violations. Once you’ve received the go-ahead, it’s as simple as buying or building a rain barrel. 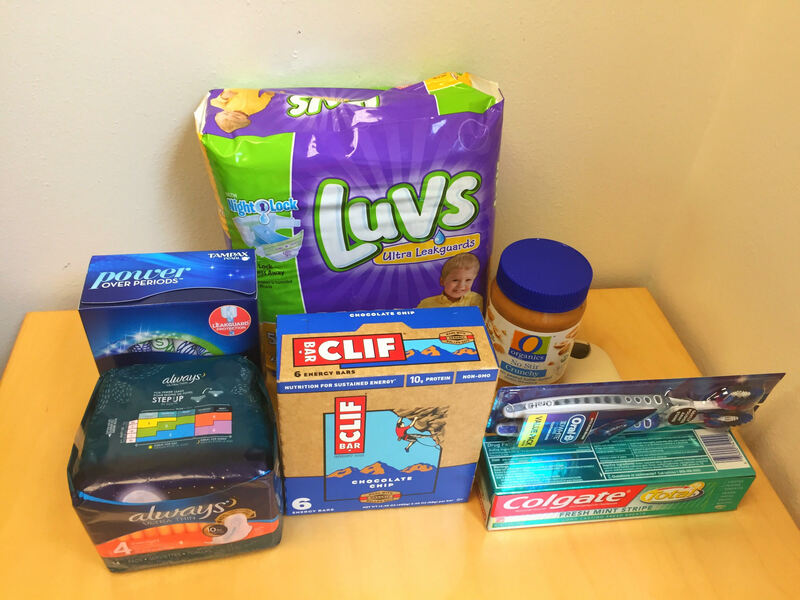 In fact, you may already have some of the supplies to build your own, such as a clean garbage can. Regardless of what type of barrel or catchment system you use, make sure it is placed under a downspout and away from utility services and septic tanks, and place a screen on top to filter out debris. If you prefer automatic irrigation as opposed to self-watering or collecting rainwater, consider using drip irrigation to maximize the water conservation effort. Home Advisor defines drip irrigation as a “low pressure irrigation system in which nozzles are placed at the base of plants and water is applied very slowly.” The biggest advantage to drip irrigation is that the tiny holes or nozzles enable water to trickle slowly into the soil, watering plants and flowers at their roots. Regular sprinkler systems often waste water, as the droplets of water are lost to evaporation in the air. Drip irrigation delivers smaller amounts of water over a longer period of time, using up to 50 percent less water than conventional watering systems and extending watering times to cut down on soil erosion and nutrient runoff. There are various drip irrigation options, including soaker hoses, sprinkler hoses, and snap-together systems. The only work required on your end is to measure the distance required for each length of hose to reach the area you wish to water. We probably all know at least one person who has a compost pile. In fact, they may have asked you to save certain materials you would usually throw away so they can use them for their compost pile. Unfortunately, compost doesn’t get the recognition it deserves in regards to its water conservation benefits. A thin layer of compost added to soil creates a barrier against evaporation, and reduces water needs by holding in water and moisture. To start composting, place your compost bin in an area close to your home and near a water source. Layer green and brown materials including dead leaves, branches, plant remnants, fruit and vegetable scraps, and coffee grounds, with each layer 2 to 4 inches thick. The following are all items you can place in your compost bin, and some may surprise you: eggshells, tea bags, yard trimmings, wood chips, hair, fur, dryer and vacuum cleaner lint, coffee filters, cardboard rolls, and shredded newspaper, to name a few. Steer clear of meat products, pet feces, fats, and grease. Make sure your compost stays moisturized to foster the decomposition process, and turn the pile at least once a week. Conserving water is a lot easier than you think. Minimal effort equates to big water savings, reduced water bills, and more water for everyone to enjoy. What are you waiting for? Start collecting free rainwater, use drip irrigation to maximize watering, and use your daily waste to create nutrient-rich compost.